Mars' Meridiani Planum, along the planet's equator, is about 29,700 square miles (77,000 square kilometers) — approximately the size of South Carolina. Deposits on Meridiani Planum can be seen in white. 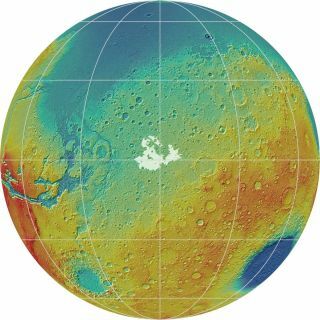 Giant deposits of ice may not lie hidden under the surface of Mars, between its equator and poles, as recently suggested, a new study finds. Researchers have long known that vast amounts of ice lie trapped in high latitudes around the Martian poles. However, scientists have recently begun to find that ice may also be hidden in the mid latitudes of Mars and even at low latitudes around the Martian equator. The researchers analyzed data collected by the MARSIS radar sounder instrument on board the European Space Agency's Mars Express spacecraft, according to the study. They focused on readings it collected from Meridiani Planum, a South Carolina-size area on Mars' equator that the Opportunity rover is currently exploring. The MARSIS instrument transmits low-frequency radio pulses at Mars, which can penetrate the crust of the Red Planet and get reflected back when they encounter changes in density or composition. The data from these pulses helped reveal the electrical properties of materials at Meridiani Planum. These electrical properties are often associated with ice-rich deposits, but "results from the Opportunity rover show there is little evidence to support an interpretation that Meridiani Planum deposits were ice-filled," Watters told Space.com. Although Opportunity found evidence of some minerals at Meridiani Planum that were once formed in or altered by liquid water, the surface deposits there are mainly composed of dry, volcanic sand. "The view of the Opportunity team has been that the Meridiani Planum deposits are dry," Watters said.Watters and his colleagues found that other materials could have been compacted beneath Mars' surface to create an ice-like signal: The data from Meridiani Planum could be explained if the materials were thick layers of ice-free, porous, windblown, volcanic sand. "Many of the recently identified non-polar deposits interpreted to be ice-rich may contain little or no ice at all," Watters said. The contours of Meridiani Planum may have made it ideal at trapping such windblown sands, the researchers said in the study. The relatively low gravity of Mars and the cold, dry climate that has dominated the planet for billions of years may then have allowed thick sand deposits to remain porous, they added. These new insights from Meridiani Planum may help researchers identify areas with and without ice that future missions to Mars can access. "The search for accessible ice in the low latitudes of Mars is becoming a major goal in support of future human exploration and the potential for the colonization of Mars," Watters said. The scientists detailed their findings online Sept. 19 in the journal Geophysical Research Letters.